Feel like breaking out of your recipe rut? Looking for fresh ways to pair wine with swine? Here are three ways to spice up your dinner, from cork to pork. So you bought pork chops, but you’re bored to tears with your same old preparation. Spice up your dinner—and your wine pairings—with three flavorful, yet easy-to-prepare methods for taking a basic pork chop to another level. Whether a fan of sweet, savory or spicy, we’ve got a technique for you. An easy and affordable staple, pork chops do well with a bit of sweetness (like the traditional apple sauce), and often an overnight brine or soak in marinade. We provide three options to customize this basic recipe for grilled chops: mixed olive and date salsa, chili-lime marinade and a shallot and mustard brine, each a wine pairing specific to its flavor profile. The shallot and mustard brine will go nicely with roasted potatoes and a hearty green salad. Go for rice noodles with the Thai-influenced chili-lime flavors. Warm grill or grill pan over medium heat. Place chops on grill. Cook, flipping halfway through, until deeply golden brown and thermometer inserted in thickest part of each chop (away from bone) registers 145°F. Transfer to platter. Let rest 10 minutes. Top chops with accumulated juices and serve. Serves 4. Sweet, salty and earthy come together in this rustic pork chop topping. Simple to prepare and complex in character, this salsa will add unexpected layers of flavor to your dish. Pairing calls for a nicely acidic Mediterranean wine that smoothly navigates the brininess of the olives without overpowering or being muted by the pronounced flavors of the meal. Tear or chop pitted olives and dates. Roughly chop flat-leaf parsley and walnuts as well. In small bowl, combine olives, dates, parsley, walnuts and lemon juice. Rub chops with extra-virgin olive oil, season with kosher salt and teaspoon black pepper. Cook chops according to instructions. Top chops with salsa and serve. Savory fish sauce meets the spice of Thai chili and the tanginess of lime in this pork marinade. A Mosel Riesling is recommended below to balance the umami characteristics of the dish, with a hit of acid on the finish to cleanse the palate. Though paired with pork here, this recipe will work just as well for other cuts of meat, particularly steak and chicken. Smash garlic cloves with the flat of a chef’s knife, chop, and set aside. Wearing gloves, thinly slice Thai or Serrano chilies, discarding seeds if less spice is preferred. In wide, shallow bowl, whisk lime juice, fish sauce, canola oil, light brown sugar, garlic and chilies until sugar dissolves. Add chops and turn to coat. Cover and refrigerate from 8 hours to overnight, turning pork chops on occasion. Shake off excess marinade from chops and discard marinade. Cook chops according to instructions. For Steven Grubbs, wine director for Atlanta restaurants Empire State South and Five & Ten, the pairing for this is obvious. “This dish couldn’t be asking any more loudly for an old-style Mosel Riesling with a little bit of weight,” he says. 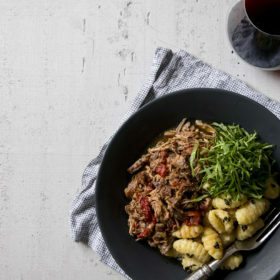 “Pork and Riesling are natural matches…The addition of the fish sauce here really cinches it. The [residual sugar] cuts the heat and balances the fish sauce’s savoriness while also matching its umami contribution. Riesling’s high acidity comes in at the end to clean it all up.” His pick: 2013 Merkelbach Kinheimer Rosenberg Riesling Spätlese (Mosel). This 8-hour brine will ensure juicier chops, with the tangy addition of mustard balanced by the sweetness of honey. Thyme or marjoram can be used in this recipe depending on availability and personal taste. A Rioja with lively acidity is recommended below as a foil to that spiciness the mustard brings, keeping any inadvertent bitterness at bay. In small pot, combine whole-grain mustard, honey, kosher salt, black pepper, marjoram (or thyme), sliced shallots and water. Simmer over medium heat, stirring to dissolve salt. Remove from heat. Stir in 2 cups ice cubes until melted. Place pork chops in large, resealable bag and pour in brine. Seal tightly and refrigerate from 8 hours to overnight. Discard brine. Pat chops dry and rub with oil. Cook chops according to instructions.